It was that kind of day, right? Well, here in NY it was, anyway. Topping out in the 70s it was one of those early days of spring where the buds are starting to burst out into flower and you can just feel the universe shift towards gentler days. When the air has that essence of earth and growth and all that damn snow is simply a memory. That would be, of course, if you were not tethered to the basement! Have no fear, I found a way to sneak a little of it in. Take in the mail, let out the dog, stand on the front stoop, you know… commuting for those of us who work at home. On one of these little mental health breaks I noticed my prized magnolia was starting to bloom. It’s not that this tree looks so spectacular, it is the fact that it survived at all that makes it so impressive. Some years back, this tree died. It made me sad because it was the very tree that I would hang all the kids’ projects in when they were little. Bird feeders, wind chimes, charming little paper plates & tongue depressor mobiles slathered with tempera paint that simply had to hang proudly in front of the house for all to see. This tree had a real personality and the perfect branch from which to hang all these treasures. When it died it felt like it took the ghosts of all those sweet memories with it. Last year I looked at the ground and saw that a shoot of the tree had started to sprout from the root ball. This season it looks like it will most probably be more of a bush than a tree, but it is flowering nonetheless. And it has a mentor across the lawn; a pear tree that was taken down by a falling willow years ago and grew back to twice its original size. stubborn as hell? I was thinking more a survivor – but yes – probably both. 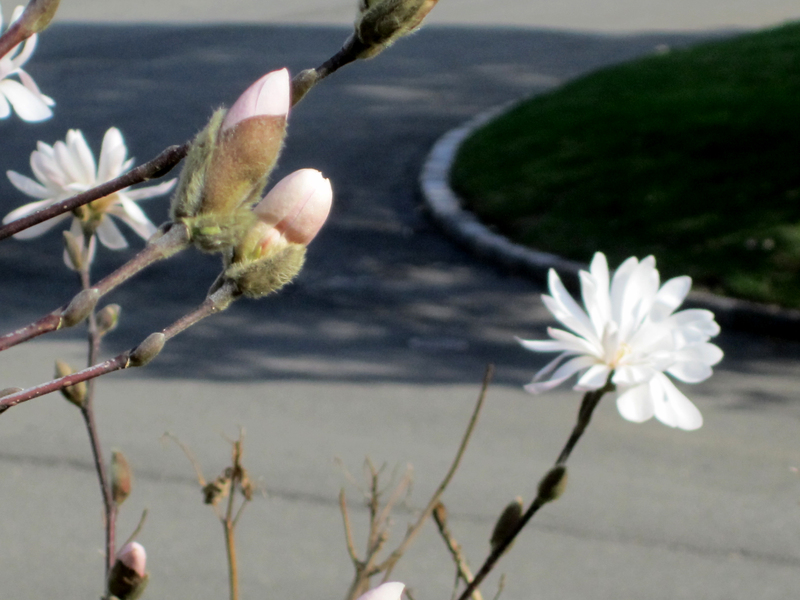 We have a tree just like that at our new house & just found out what it was (royal star magnolia) the other day. Yeh, those art projects hung everywhere! Leave it to you, researchgirl, to know the name of the tree. Love this story in so many ways. It could even kind of represent you and your new budding life as empty nesters. Thanks Margi. About that ‘budding life’, my daughter is graduating and moving home so the nest, she is not so empty anymore. Of course, I am sure she won’t stay long but looks like we have a roomie for now.